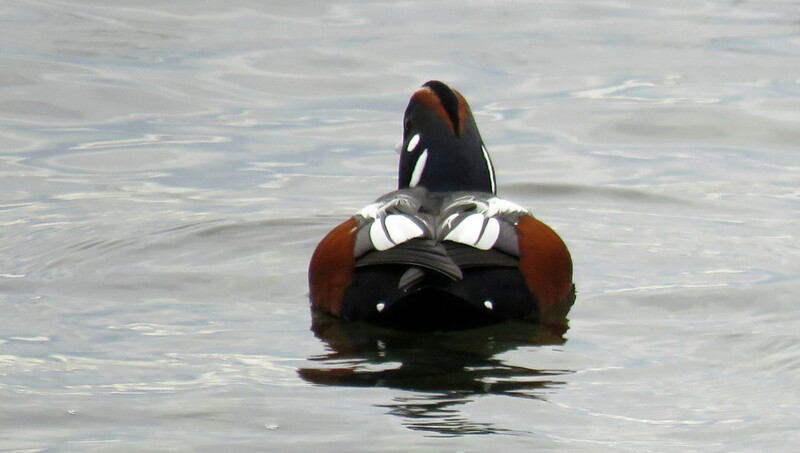 Here's a closer look at the Harlequin's neat feather markings and colors. This shot was taken a few days ago from Lincoln Park Beach. Thanks for stopping by. Great shot Gloria, the markings are wondetful and so symmetrical, fav! Great shot and angle. Fav. Very cute and I love his colors. A nice shot of the detailed markings. Beautiful colours. He looks quite abstract from this angle. that looks unreal, like a toy bobbing on the water - totally awesome! They are such a striking water bird. You really captured the details so well. Great shot. Love the markings on this duck! He is perfect! It almost looks like a carefully colored pencil piece! I think they are such a lovely and unique duck - great shot! How crisp their markings are - they really are beautiful. Love the angle and the markings.